Complexes of the Rare Earths focuses on the properties, characteristics, and reactions of rare earth complexes. The book first offers information on the complexes of rare earths and coordination through nitrogen of the donors. Discussions focus on the factors influencing the formation of complexes, phenanthroline, phthalocyanine, pyridine, quinolone, and urotropine. The text then elaborates on coordination through oxygen of the donors, including acids, alcohols, adducts, aldehydes, and ketones. The publication takes a look at coordination through both oxygen and nitrogen of the donors; coordination through atoms other than nitrogen and oxygen; and spectral characteristics of rare earths and their complexes. Topics include crystal field splitting, intensification or hypersensitivity of absorption bands, electron transfer spectra and optical electronegativity, and nephelauxetic effect. The text further ponders on luminescence of rare earths in chelates and in different environments, laser and applicability of rare earths as laser materials, and rare earths and the actinides. 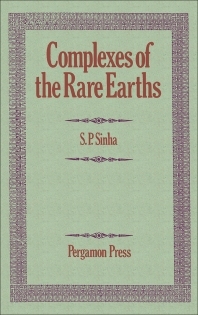 The book is a dependable source material for readers interested in the complexes of rare earths.